The first completed through hike was accomplished by Eric Ryback on October 16th, 1970. Eric Ryback was an 18-year-old student at the time and is credited and recognized as the first hiker to make it all the way through. He also helped the Forest Service lay out future plans for the PCT after his trip and by sharing his experiences. The Pacific Crest Trail spans 2,650 miles (4,265 km) from Canada to Mexico and passes through California, Oregon and Washington. It takes you through beautiful desert scenery, into the spectacular peaks and glaciated mountains of the Sierra Nevada, through the forests of Oregon and Washington and the expansive vistas and volcanic peaks of the Cascade Range. One of the most recognized and idolized trail systems in the world, the Pacific Crest Trail seems to symbolize everything there is to love, respect and admire about the Western United States, along with other icons such as Yosemite and Mt. Whitney. Possibly. Permits are required in certain areas that the PCT will pass through. These are anything from wilderness areas, National Parks, CA State Parks and other restricted areas along the trail will require permits for all overnight travel and camping. You can obtain a permit from the agency of where you plan to start your trip. For example, if you plan to start your trip out of Inyo National Forest, you will need to obtain a permit from them before heading out on your adventure. 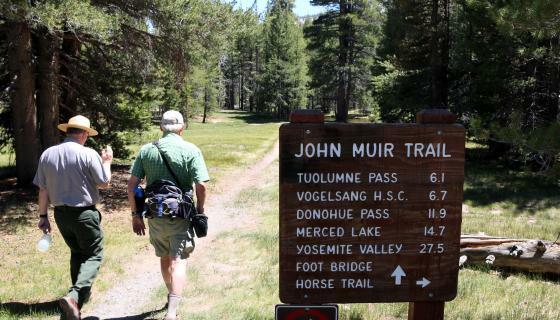 The Pacific Crest Trail Association can and will issue permits for trips longer than 500 miles. Their page on permits is extremely helpful and knowledgeable. That page can be found HERE, but below is a summary of the permit process for both trips that are under or over 500 miles. Some places along the PCT may require camping permits. Most agencies require overnight permits while in their area, except for the Bureau of Land Management. Always check the local agency&apos;s website and/or contact their visitor center for more information regarding permits. And remember to check out Recreation.gov&apos;s website for reservation information as well. In California, overnight permits are generally obtained from the agency that oversees the area that your trip will be starting out of. If that area does not require a permit, then you will need to obtain one from the first agency that requires one on your itinerary. The permit issued to you should cover you for your entire trip, regardless of whether or not you cross into other management boundaries, but be sure to check with the local agency for details. Some trailheads may have quotas (limits on the number of people they will issue permits to per day), so it is always best to plan ahead and double check before heading out on your adventure. If you plan on hiking or horseback riding for 500 miles or more continuous miles along the PCT, the Pacific Crest Trail Association can issue you a PCT Long Distance Permit. These permits are free and the PCTA issues permits with the authorization of federal land management agencies to simplify the planning process and improve service and the flow of information. These permits are issued for the Pacific Crest Trail Corridor ONLY, and visitors wishing to travel off the PCT corridor must obtain separate permits as necessary. You may however, travel off the PCT to nearby trailheads for reasons of resupply and reaching or departing the trail and must be done by the most direct route from the PCT to the trailhead. Southbound travel from Canada: Because of U.S. Customs and Border Protection regulations, no permits will be issued from Manning Provincial Park in British Columbia, Canada. Areas of special concern: Please visit our Mt. Whitney page and read the specific regulations and permits required to enter into the Whitney Zone. There is also other special information pertaining to not camping on the rim of Crater Lake and the Obsidian Limited Entry Area that should be taken into consideration while planning your trip along the PCT. Group Size: Long Distance permits are not issued for groups. The permit is only valid for the individual who&apos;s name is on the permit... One permit for one visitor. Minimum age: All hikers who are under 18 and wish to hike on the PCT need to have a written and signed letter of consent from your parent or guardian. The letter must include the dates and locations of your proposed trip and under age individuals need to carry this letter at all times while on the PCT. Permit applications for unaccompanied minors under 16 years old will be reviewed by the U.S. Forest Service. Animals: National Parks, State Parks and Wilderness Areas have varied restrictions on pets and pack goats. These animals are not authorized through Long Distance Permits. Llamas also have special restrictions. You can find out more or request information by writing to info@pcta.org. Fire restrictions may or may not be in place during your trip on the Pacific Crest Trail, or any visit to the Eastern Sierra for that matter. It is best to check with local fire departments and visitor centers for any restrictions in place while you will be in that area. For specific restrictions along the Pacific Crest Trail, the Pacific Crest Trail Association has a great webpage about current restrictions and information that they update on a regular basis. This way, if you are planning on hiking the PCT, you will know mile by mile what restrictions are currently in place. You must have a California Campfire Permit to use a stove, lantern, or campfire outside a developed campground or recreation area. However, campfires are not allowed on much of the PCT. It is also highly recommended that all hikers using the California backcountry to obtain a California Fire permit. They are free and valid for one calendar year. These permits should be acquired before you start out on your trip and can be obtained at any BLM, Forest Service or California Division of Forestry office. Ranger Stations and Visitor Centers may also issue these permits in person, or you may take a simple quiz online and print one off before beginning your trip. Along with your Hiking Essentials, here are 6 tips that the PCTA suggests you bring on your trip along the Pacific Crest Trail. - While the PCT usually has sunny, warm weather and beautiful hiking conditions during the summer, some of the worst weather in the country can and may occur on the trail... yes, even during summer months. So, make sure to always carry equipment for bad weather so as to prevent exposure to cold and hypothermia. - Keep your gear lightweight and easy to carry. Do not burden yourself with extra gear or a wardrobe that was made for the racks of Rodeo Drive. - Equipment and research are no substitutes for experience. Definitely read up and find out as much information as possible on the PCT, but also remember to test your gear (and yourself) on smaller, more manageable trips before heading out on the PCT. - No equipment is perfectly suited to all conditions. Experienced hikers know to carry a wide variety of gear and that all gear involves some sort of compromise because none of it is perfect. Choose your gear based on your desired level of personal comfort, fitness, skills and experience out on the trail. - Bring gear that is right for that time of year. While your summer gear is lightweight and easy to carry, it won&apos;t be enough during the shoulder seasons or the middle of winter. Be smart and carry the gear that is appropriate for your current season. - Be prepared. From gear to plans to back-up plans; always make sure you are prepared.